Millions of people around the world are heavily reliant of ecosystem Services provided by forests and other habitats for their livelihoods. : Photo credit: Madagasikara Voakajy Dr Julia Jones, the project leader and senior lecturer in the School of Environment, Natural Resources and Geography at Bangor University, said: “When you book an air ticket you may be given the opportunity to offset the carbon produced by the flight. 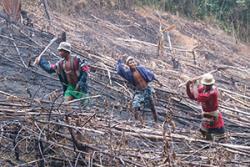 This money is increasingly going towards schemes which aim to reduce deforestation in low income countries. The funding comes from the Ecosystem Services for Poverty Alleviation (ESPA) programme, a £40 million initiative from the Department for International Development, the Economic and Social Research Council and the Natural Environment Research Council. 'The three year project 'P4GES: Can Paying 4 Global Ecosystem Services reduce poverty?' involves a consortium of institutions in the UK, Madagascar, the Netherlands, and the USA. Professor Bruno Ramamonjisoa from the University of Antananarivo in Madagascar, one of the project’s leaders, said ‘Madagascar is a very poor country with millions of rural people heavily dependent on natural resources. This research will help ensure funds from international ecosystem payment schemes make a real difference to people’s lives’.